A group of Sunni Arab tribal leaders has voiced support for the non-binding independence referendum passed by northern Iraq’s autonomous Kurdistan region this week, denouncing Shiite-led Baghdad’s opposition. Meanwhile, Turkish Prime Minister Binali Yildirim said Thursday that Sunni-majority Turkey “will continue close cooperation” with its predominantly Shiite neighbors Iraq and Iran to take action against the Kurdistan Regional Government (KRG) in response to Monday’s independence vote, reports Hurriyet Daily News. The referendum has driven a wedge between the long-term relationship between Turkey and the KRG. In a joint statement issued after they met in Kurdistan’s capital Erbil on Thursday following the independence vote on Monday, the Iraqi Sunni tribal leaders declared that “the self-determination right is a natural and embodying right admired by all the religious texts,” reports Rudaw. While the vast majority of Kurds are Sunni, there are some Shiites, particularly in and around Iran, which has also come out against Iraqi Kurdistan’s independence efforts. Sunni Kurds and Arabs have not always seen things eye to eye. In early 2015, Sunnis displaced by the Islamic State (ISIS/ISIL) complained that the Kurdish Peshmerga forces prevented them from returning home after they liberated the territory from the jihadist group. However, the Iraqi Sunni Arab tribal leaders described the approval of the independence referendum as the beginning of a new phase of relations to resolve the problems afflicting Iraq and ensure equal rights to Kurds, Arabs, Sunnis, Shiites, Turkmen, and Christians. Sunni Arabs have been disenfranchised in Iraq under the Shiite dominated government, particularly under former Prime Minister Nouri al-Maliki. “The Sunni Arabs of Iraq are facing the threat of terror. The Iraqi government is pursuing sectarianism as we are prohibited entry into Baghdad for four years now,” Najih Mizan, spokesperson of the Sunni Arabs, told reporters, according to Rudaw. “The Kurds played a fundamental role in the new Iraq. We are rejecting any form of punishment against the Kurdistan Region,” added the spokesperson. Representatives from several ethnoreligious minority groups in Iraq, including Christians, Yazidis, and Turkmen, have told Breitbart News that they vehemently oppose the independence efforts. Nevertheless, Breitbart News learned that not all minority group members are against Kurdistan becoming a sovereign nation. Some Christians and Yazidis have expressed support for the move. Despite their differences, their mutual animosity against ISIS has resulted in Sunni Arabs, Kurds, Turkmen, Christians, and Yazidis coming together to fight the jihadist group. Echoing one of the White House’s reasons for opposing Kurdistan independence, Col. Ryan Dillon, a spokesman for the U.S.-led coalition, argued that the “yes” vote in the independence referendum has diverted attention away from the fight against the terrorist group. Not all Sunnis have dismissed opposition to the referendum. Sunni-majority Turkey has threatened the “harshest response” to Monday’s approval of the non-binding resolution. “Turkey will speak directly to Iraq’s central government on issues about borders, airports and economic relations, he [PM Yildirim] said, noting that the three countries were doing their best to overcome the crisis caused by the referendum with the minimum damage,” reports Hurriyet. 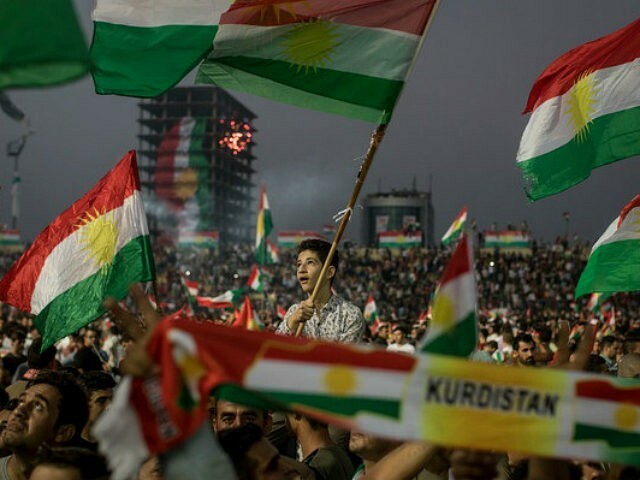 Neighboring countries, including Turkey, Iran, and Syria, are against Kurdistan’s independence because they fear it will motivate separatism among the Kurdish population within their borders. In Iraq, Sunni Arab tribal leaders and Peshmerga forces loyal to the KRG have condemned activities by Iran-allied Shiite fighters sanctioned by Baghdad, known as the Popular Mobilization Forces (PMF/PMU) and Hashd al-Shaabi. Peshmerga troops have clashed with the PMF fighters in disputed territory claimed by the KRG and Baghdad. “After 92.73 percent of voters chose independence for Kurdistan in Monday’s referendum, Baghdad has rejected the result and issued a series of orders to ban flights, shut the borders, close foreign representations, assert control over oil exports, and deploy troops to disputed areas,” reports Rudaw. “Both Erbil and Baghdad are accusing the other of acting illegally and contrary to the constitution,” it adds.